We spoke with customer John McDougall, who recently purchased the Prodigy 2.0 Adjustable Bed Base by Leggett and Platt. John talks about why he purchased this adjustable bed, what makes it different, some of the unique features that are included, and his opinion of the bed base after trying it in his home. John Maher: Hi, I’m John Maher with Gardner Mattress, and I’m here with John McDougall to talk about the Prodigy 2.0 Adjustable Bed Base by Leggett and Platt. Welcome, John. How are you doing? What Made You Decide to Buy An Adjustable Bed Base? John Maher: John why do you decide to buy an adjustable bed base? John McDougall: Well, when my wife and I were in the hospital after having our baby recently, we just fell in love with the idea of having the mattress go up and down, and adjust to watch T.V. I started thinking about it, and realized for her to be able to do nursing, and being in bed a lot with the baby, it probably will be a good idea. So, I started researching it. John Maher: Okay, and what are some of your favorite features of the Prodigy 2.0? John McDougall: Well, there are a lot, so I have a little list here. It’s adjustable, obviously, that’s not the main thing, but it’s also programmable. You know, you can hit a button and go right back to where it was. John Maher: So, it has certain settings that you can press the button and it goes right to that setting? John McDougall: Yes, then you can make some of those up yourself. John McDougall: And it has pillow tilt, not just having foot tilt, which I guess is new for this style of bed. So, you can really fine tune for the comfort of your neck. John Maher: You mean that your whole upper body doesn’t have to tilt up. You can just tilt it so that your head is mostly up. John McDougall: Most often you’re tilting the back of the bed up, and then you fine tune for your head and it makes it more comfortable for using a laptop or certain types of positions. John Maher: You’re not staring at the ceiling. John Maher: There are USB ports on the bed? John McDougall: Yes. On the side of the bed, and built into the bed frame, and you don’t realize until you have it there how useful that is, because you’re always running around trying to find a place for your iPhone, or you have it in a certain place, then you move the cord or whatever. You have four ports right there, so she has her iPad and iPhone right there. John Maher: That’s a great feature. You don’t have to worry about, like you said, having the plugs in the wall, and then maybe the bed frame knocks the plugs out, and then your phone doesn’t charge. I’ve had all kinds of issues like that with mine, so that’s great. John McDougall: Yes, it was a smart idea. Then she loves the massage feature; it has a bunch of different settings, I forget the name of it, but the Prodigy 2.0 has extra awesome massage settings. She said it’s really good. John Maher: Okay. What else? John McDougall: There is a light under the bed. I actually found that cool. You just walk in the room and there is this ambiance you just weren’t expecting, because I wouldn’t say it’s like a night light, but it just gives you just enough light in the room if you walk in and the light’s on at night. Just a cool feature. John Maher: What color is the light? John McDougall: It’s white, but you know what, I think you can make it other colors. John Maher: You can adjust that, yes. John McDougall: There’s a great remote, kind of high tech looking remote, and you can also use, if you want, an app, so you can adjust the bed through your phone. John McDougall: It has a sleep timer which changes the position at a set time. So, you can wake up and it’s time to watch T.V. [laughs] I personally haven’t used that, but that’s pretty cool. It has an alarm clock, has an adjustable height so, you know, you can raise the bed up even higher or lower. It has “wall hugging” technology so, some of the adjustable beds, as it moves, it pushes you away from your side tables, where maybe your water, or book is or something. But, this keeps you in the right position right next to your stuff. 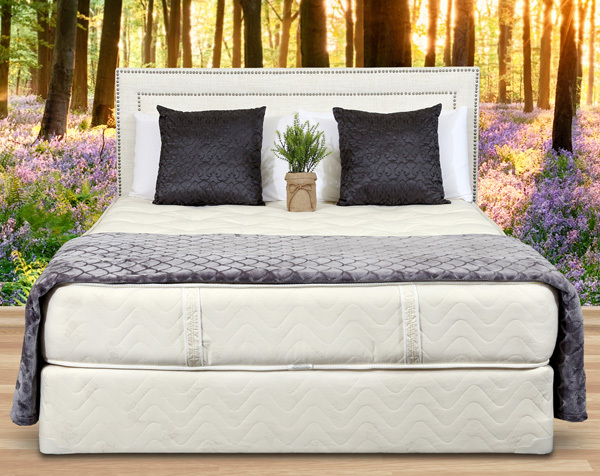 The retention bars are no longer required, due to the microhook technology, something like that, where when you put the mattress on the adjustable bed base, it stays there, it doesn’t slide easily. John Maher: That’s an issue sometimes with adjustable beds, where the top mattress floats around. John McDougall: Yes, so they have a retention bar which looks a little bit like a hospital bed, because it’s like you have this clunky thing there. It comes with it, you can use it, but you don’t really necessarily have to, given this new technology, which is a nice feature. John McDougall: So the thing is moving around, and it’s staying in the right position, has all these fine-tuning things, it doesn’t slide on you. It’s really well thought out at this point. John Maher: Why the Leggett and Platt brand? John McDougall: Well, Kirk at Gardner Mattress is awesome, and he’s given me a lot of great advice on different things. I was asking him about this, and he was just describing that, for the money, it’s unbelievable what you can get. It used to be so expensive. You saw the T.V. commercials 10, 20 years ago, for these expensive adjustable beds, and it was kind of out of reach. Leggett and Platt just makes these awesome, crazy, full-featured adjustable bed bases, and they’re just reasonably priced. So, I thought that was good. John Maher: Why the Prodigy 2.0 model specifically? I’m sure that they make a number of different kinds of adjustable bed bases. John McDougall: Yes, so, they have the Escape, the lower model which is good, but the Prodigy 2.0 has the feature that I mentioned with the head tilting, the pillow tilt. It just has the right amount of features and the right price. You can go up to the premier, and the premier has a furniture style, so it’s really designer-y; it looks really awesome and has this whole higher look to it, but the Prodigy 2.0 has a great look to it; it doesn’t have the extra padding of the furniture style thing, and I think there are a few more programmable settings. There might be seven with the premier, where you might have two or three less with the Prodigy 2.0, but I don’t really need seven settings. John Maher: How many settings do you need? One for watching T.V., one for your laptop, and one for sleeping, or one or two for sleeping, or something like that, and that’s about all you need. John McDougall: Yes, so, to me, there weren’t enough features to justify a pretty steep increase to the premier. John Maher: Okay. Was it easy to set up? John McDougall: Well, I’ve bought a number of things from Gardner Mattress, and their delivery guys are awesome. They came with this thing and it was almost like they were in and out of there too quick. [laughs] It was awesome. They came, they took the box off in the garage, brought it up through the steps from the garage to the upstairs. Then they basically just put it in place and showed us how to use the remote, and they left. It’s amazing. It seems like this big hectic piece, heavy thing that you’re going to be dealing with, but really just a couple of guys show up and put it [together] in 10 minutes or something. It was really easy. John Maher: Do you have any recommendations for people buying an adjustable bed base, things to look for? John McDougall: The only thing that my wife was surprised at a little, and it wasn’t a big deal, but it was a little higher; so it does have the adjustable legs, but there is a minimum — I don’t know what the actual height is, it’s not very high off the ground — but it has to have a little bit of room under it. When it moves, it’s got to crunch together, so there’s really something happening under the legs. When you have a box spring, if you wanted to just put it on the ground, you wanted it to be really low on the ground, you can do that. John Maher: This can’t be flat on the ground. John McDougall: This can’t be 100% flat on the ground. It doesn’t have to be super high, but because we have a pretty thick mattress, and then we have foam…you know, we got rid of, and Gardner took it away for us, the delivery guys who got the mattress, but without the box spring, our mattress is — I have the harmony, and she has the ergo, the organic one. It’s not overly thick, but she also added a pillow top to it. She has an extra thing on top of it that makes it a little thicker. When you put both of those, the mattresses and the topper, on top of it, and the fact that it has to be a little bit above the ground to be able to move, she just at first was like, “It’s a little higher than I thought,” but she quickly realized that that was fine. John Maher: It’s worth it. John Maher: It’s probably just a matter of just getting used to it. You are used to sitting down on your bed and having it be at a certain height. This might be a little bit higher than that, but you get used to it. John McDougall: Yes, that was like five minutes, we had that conversation. [laughs] Then actually, she realized that we have the, not the bassinet, but like a pack-n-play type of crib, because the baby’s only a couple of months old, so he’s not in the big crib yet. So, if she has the pack-n-play type of crib right next to the bed, it was too high before, and now with the mattress a little higher, she’d put him in that, and it’s perfect. Before, if he was down in the swing, and she felt like she was up higher, then she just moved him into the pack-n-play with a mattress that’s pretty high. It’s really at a good level now. There’s always little adjustments that you make. So, just be aware of small things like that. Again, if you’re buying this new, think about that. If you’re buying a mattress and this at the same time, you could get a thinner mattress if you want it to be really low. Actually, the Prodigy 2 goes higher, so you could go higher. John Maher: So you can put that up? John Maher: Just buy a thinner mattress. John McDougall: — a thinner one, or the next time you buy one. Now that she got used to it, now she likes that stuff, right? So, it’s all the little things to get used to, but overall, we love it, definitely recommend the Prodigy 2 by Leggett and Platt, and if you’ve never gotten an adjustable bed base before, definitely give it a try. John Maher: All right, that’s a good recommendation, and thanks again for talking with me today, John. John Maher: If you have questions about the Prodigy 2.0 Adjustable Bed Base, or any of Gardner Mattress’ products, visit the website at gardnermattress.com.